The following article originally appeared in The E-Sylum: Volume 21, Number 25, June 24, 2018. A local TV station in Albany, NY ran a story about a medal being created to honor a local WWI hero. One of the nation’s oldest coin shops has minted 500 silver coin-shaped medals honoring African American World War I hero Sgt. Henry Johnson. Ferris Coin Co. will premiere the medals at The Palace Theater in Albany, N.Y. on Wed. June 27. The medals are priced at $29.95. 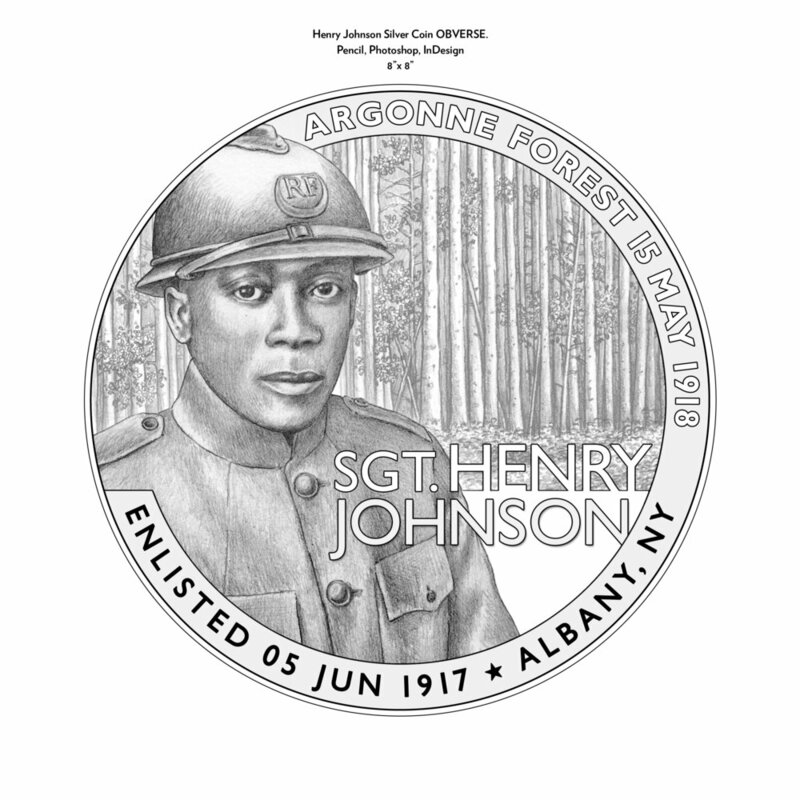 On June 5, 1917, Albany resident Henry Johnson enlisted in the first African American unit in the U.S. Army to engage in combat in World War I. On May 15, 1918 in the early morning hours, then-Private Johnson heroically fought off a German raid in hand-to-hand combat, saving the life of a fellow soldier. He was wounded 21 times. For his bravery, Johnson received France’s highest award for valor, the Croix de Guerre avec Palme, becoming the first American to receive this distinction. He received no military medals from his home country during his lifetime. Sgt. Johnson returned to Albany in 1919 and struggled to readjust to civilian life and hold down steady work. He died, destitute, in 1929, in his mid-30s. He is buried in Arlington National Cemetery. Sgt. Henry Johnson was finally recognized by the United States government for his service to his country when he was posthumously awarded the Purple Heart in 1996 and the Distinguished Service Cross in 2002. In 2015 he was awarded the National Medal of Honor -- the nation’s highest military honor -- by President Barack Obama. In March, Ferris Coin Co. announced a nation-wide competition to design the obverse and reverse sides of the medal with a $1,000 prize per side. An expert jury composed of esteemed professional artists and a representative of the 369th Veteran’s Association (the regiment Johnson served with) evaluated the contest entries. Artists of all levels from across the country submitted designs, including several artists whose work has been featured on U.S. Mint coins and one world famous medallic sculptor. Though the jury was free to select any combination of designs, it chose both of Chris Costello’s designs for the front and backside of the medal. Costello’s artwork has appeared on 23 U.S. coins and medals, including one Congressional Gold Medal. A native of Kingston, N.Y., Costello now lives in Arlington, Mass.